The Emerson sits at the intersection of New and Old in the historic suburb of Oak Park. The suburb’s bustling downtown enjoys easy transit access to downtown Chicago, and consistently attracts busy young professionals in search of a lifestyle that blends urban and suburban qualities. At the same time, this well-established enclave is proud of its historical heritage, with many significant buildings making up a quaint walkable streetscape nearby. 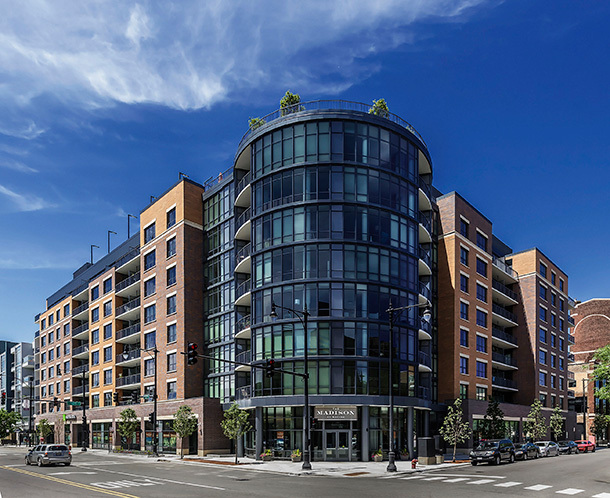 The Emerson is a model for mixed-use, transit-oriented suburban development, offering walkable retail shops, a Target flexible-format store, public parking, and 270 luxury apartments in studio, one-, and two-bedroom floor plans. 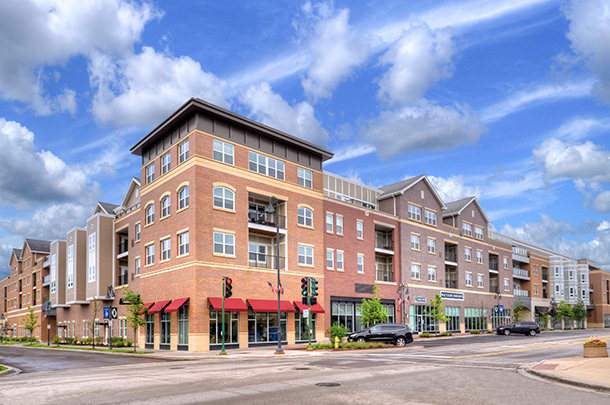 The Emerson’s position between Oak Park’s historic shopping district and busy commuter rail lines meant that the design needed to blend well with the context of the shopping district and provide a dense transit-oriented residential component. This was accomplished by designing the north building as a logical continuation of the low-rise corridor nearby, standing five stories and built from more traditional materials. 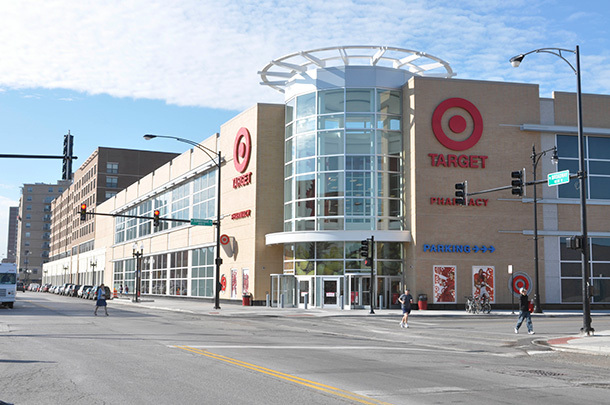 The north building contains 80 apartments and 21,000 square feet of retail occupied by a Target flexible-format store. Along the rail lines, a much taller building, in a modern language of concrete and glass, could be developed. The south building is 20 stories tall, contains 170 apartments, 424 parking spaces, amenities, and management offices. Between the two buildings, a pedestrian bridge spans over Westgate Street, providing North Building residents with sheltered access to parking and amenities. The two buildings at the Emerson present residents and guests with options that represent both of these influences: the low-rise north building has a decidedly suburban feel, with traditionally-sized windows, finished ceilings, and smaller-scale public spaces with intimate spaces and soft furnishings. The high-rise south building brings a more contemporary sensibility, with double-height public spaces and exposed concrete touches. 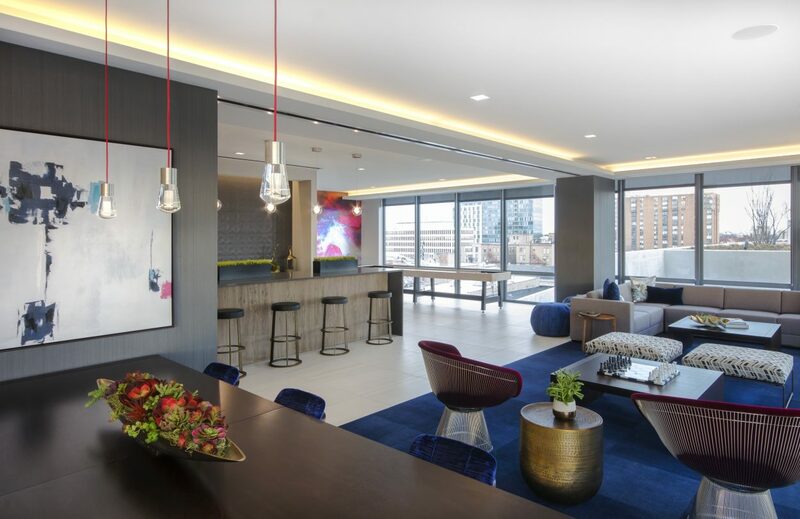 Shared amenities blend the two aesthetics across comfortable lounge spaces, coworking suites, and a shared club room. Originally offered by the Village of Oak Park as an RFP seeking developers, these two centrally-located lots previously held underutilized commercial buildings which were razed for surface parking lots. The site held incredible promise as a transit-oriented development, since residents would be just steps from both Metra commuter rail and CTA light rail, which together serve approximately 5,000 passengers per day. More than a dozen commuter bus stops can be found within a 1/4 mile radius of the site, serving four different major routes. The prominent intersection of Lake Street and Harlem Avenue provides easy vehicular access to and from the site. Both corridors feature a mix of retail and entertainment establishments, and the Lake Street corridor is widely considered the heart of Downtown Oak Park. Adjacent to the site, Oak Park’s historic district influences the development to fit respectfully into the neighborhood, and it is also a large draw for residents. 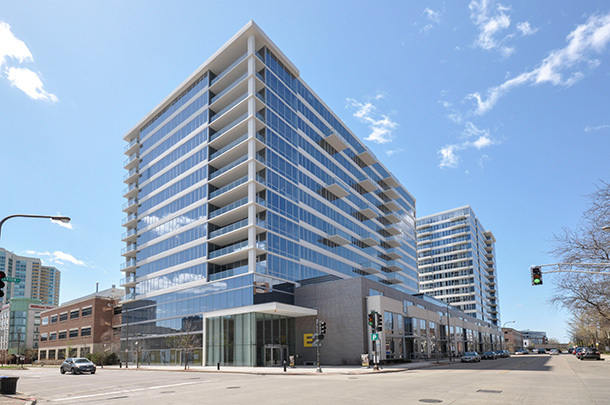 The Emerson’s north building blends with the nearby historic district and Lake Street shopping corridor with traditional materials and low-rise massing. Built from wood construction over a concrete retail podium, the building has a decidedly more suburban feel, with traditionally-sized windows and smaller-scale public spaces. an urban aesthetic found most often in downtown multifamily properties.